I never make sympathy or birthday cards before I know to whom I am sending it. I always want the card to reflect the person I am sending it to...to make it more personal. I had to make a sympathy card for a friend who is male and is married, so it couldn't be too feminine. Here is the very simple card I came up with. 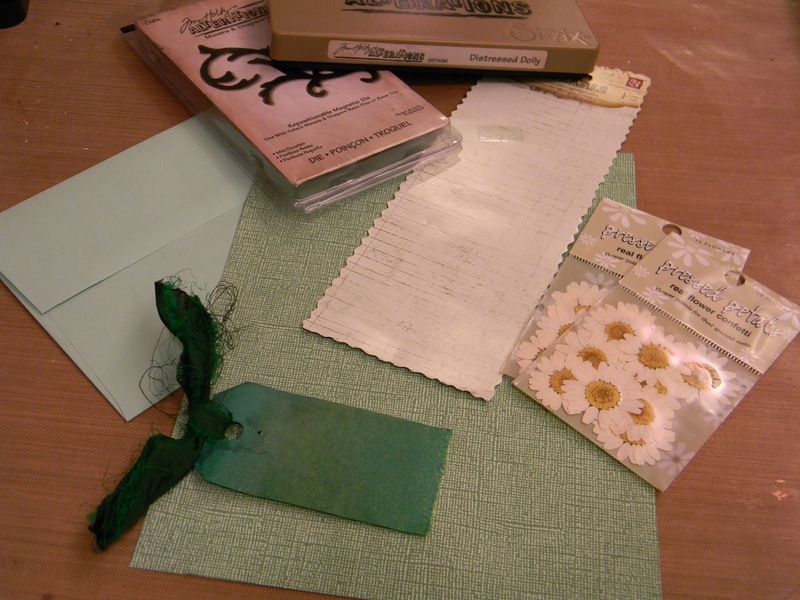 I am also submitting it to the Gingersnaps Creations color challenge for "glorious greens". I did not end up using the flowers, as it looked too feminine. I love Prima packaging. It is great for repurposing. The little green tag was given to me with a charm on it from Nancy Arbuckle-Mayer, from the ATT Yahoo Group. It is too cute and perfectly colored and distressed not to use for something. Thanks Nancy! I used corrugated paper to die cut the flourishes and lace. 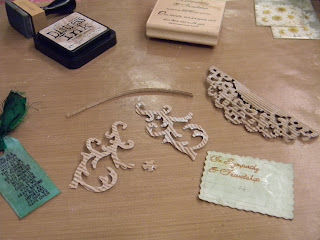 They were inked with Pumice Stone Distress Ink. I heat embossed the sentiment on the Prima packaging and then coated it in Clear Rock Candy Distress Crackle Paint. I applied gesso first and then stamped the green background with script in Evergreen Bough. The green mini tag was stamped and heat embossed with the Time sentiment using Archival Ink and Vintage Photo Embossing Powder. Very beautiful. The corrugated card is a lovely touch. 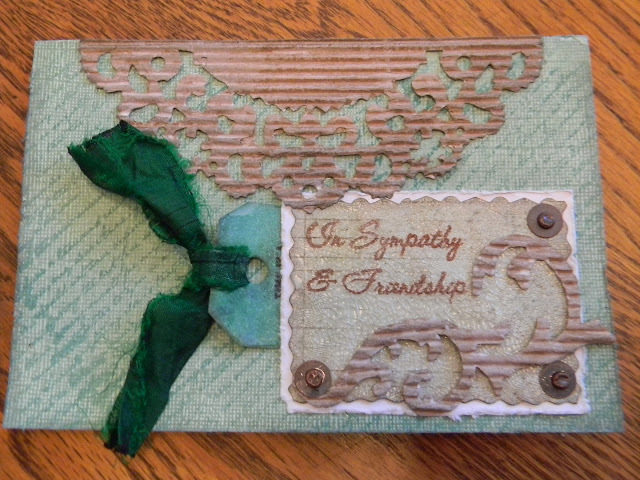 I find sympathy cards to be the hardest to make. You've done a wonderful job here. That green pull-out tag is such a warm and lovely accent! Beautiful creation. Love the textures on this, very earthy.